More has to be done then just closing walleye ! i have fished many lakes where they tried this the key to a good fishery is a healthy spawn if the babies dont servive all that happens is you get larger OLD walleye and then they disappear . stocking is the anwser i have seen much success in places that stocked walleye fry 8inches long they will eat there weight in small perch and crappie and bring back the fishery. catching smaller fish means FUTURE fish. i have a home lake that has bass that all seem to be big no small ones are being caught. you might think that is a good thing but its NOT with no small fish that lakes bass are slowly dying. I love crappie fishing .they make an amazing fish fry. however they are minnow eaters and will eat alot spawned fry .i think the best way to control them is to harvest more pan fish. Leave the walleye alone period, no fishing for them, the folks that keep fish over the limit and ignore the rules will pretend they are catch and release fishing. The hordes have killed the lakes walleye. I am sure there is still ignorant people catching them Out Of season, on spawn beds when they spawn and will continue in the winter.. Stocking should happen and the local folks who rent rooms sell bait rent cottages, sell gas , sell food coffee and earn a living off fisherman should really look into pooling up and getting a hatchery started. My bet is fisherman will help out as well plus a few bucks from licences.. If you see poachers make a call, take a pic.. I don't fish Scugog just driveover that causeway every weekend in the summer going to my trailer water was so low this year. still guys fishing in the tiny bit left like they would starve without a fish.. Look at Simcoe herring coming back like crazy left alone for years now they are so thick sometimes you cannot drop a lure past them it is great.. Take the hit leave them alone and get this government to enforce the rules about shorelines and poaching and help out if you see things.. I bet in five years if we can keep the poachers at bay we will have crap loads of fish again.. If you gotta fish fish for invasive species and kill them.. Carp, Gobie, while you fish Crappie perhaps the Min should let us double rod as long as we are targeting invasive s.. I would like that. When MNRF held their open house public forums in Port Perry in 2015 seeking public input on options being evaluated re restoration of walleye on Scugog there were two fishing clubs who had experience raising walleye for Simcoe they offered their facilities and another guy said he would seek funding from OFAH to cover the costs for the hatchery. MNRF biologist said that stocking fish would not work. Release of pan fish in lake, agricultural runoff in Nonquon, zebra mussels and over fishing had destroyed the population. Guy on Washburn Island said he said had been seeing large fish during spawn which he thought were females were schooling over rock/gravel off his shoreline as they had done for 25 years he owned the property. He felt the slot limit MNRF had imposed had taken out the males so there were not enough males to fertilize the eggs were a more significant factor. Another guy pointed out that Scugog was a man made lake, flooding back when Trent Canal was built in 1800, and that stocking walleye back in 1920-50 had established the lake as a destination walleye fishery for GTA in 70-90s. So he questioned MNRF biologist why they thought natural reproduction for an unlimited time frame would restore the population instead of working with the two fish clubs in a restocking program. (Over 90% of stocking though the Community Hatchery program is with walleye in Ontario) It was like looking at a deer caught in the head lights of a truck on the highway. Her boss came to her rescue and offered to meet after the public meeting with hatchery club. That was over 18 months ago and the meeting has yet to be held. "closed for netting" as well? If the MNR has determined that stocks are down, they probably are. Of course a lot of fish are wasted in netting campaigns. I knew an MNR biologist who said anglers would be appalled at the waste of fish. So, fish are down and you need steps to protect the fishery. A moratorium is the most logical approach. I don't think you can blame crappie and sunfish because there are many lakes where all species exist just fine. It's probably a combination of factors. For years everyone went to Scugog and that lake got slammed. This kind of pressure is unsustainable, hence the current problem. 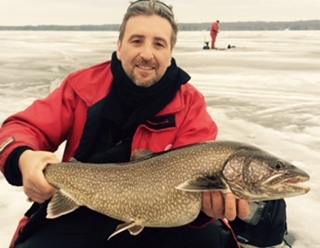 Control programs have worked well in Simcoe as some species there have rebounded well. I would agree with Fishing Rod..what in hell is wrong with Catch and Release in this country? For some reason, the majority of fishermen have this need to keep fish everytime out..WHY? Are we starving to death or is it just an ego thing to show off your catch. If you have ever fished on a Catch n Release lake in the USA or Mexico as an example, you would certainly change your mind on this wonderful concept.. I really think there is a great opportunity here to help rebuild the walleye fishery in this lake. Firstly begin by reducing the limit; secondly close the winter fishing completely including pan fish; thirdly an aggressive restocking program for 5 years to rebuild the number and lastly alter the slot size so that the larger fish especially the females are left alone. I catch walleye all the time fishing for bass and muskie on scugog. the walleye we catch are good size and healthy. I also know that there are people living on and around the lake ice fishing and keeping walleye !!!!!! I also know people were greedy back when walleye was open, that they had to have a freezer full, why? As for the Ministry, anything that is run or overseen by a government body is mismanaged, cut backs always come into play but fees still go up, and our money never gets utilized properly. I work for a government body and I'm tired of seeing people retain these jobs and have no clue as to what there are talking about. Im talking all levels government , Municipal, Provincial and Federally. Gun registry was a joke and cost us millions. That money could have been utilized for stocking and technology/research. I don't want to rant but there are also people fishing with different ethnic backgrounds that have zero respect for any of our natural resources. throwing poop in lakes tied in bags, leaving garage everywhere, keeping every fish they keep regardless of size. I've seen it , they do it on our beeches and try to hide it in the sand. We have garbage use them !!! witnessed it all and spoke to game wardens and research division, nobody cares until its too late then as an a solution we'll just shut the fishery down. Nothing wrong with the fishery on Scugog, trust me I catch lots of everything and throw it back. Problem is in front of us , tired of everyone scared to say who's doing what. Scugog is a lake that reminds me of the state a lot of Lakes around where I used to live where like (Algoma area). Bigger lakes but shallow. A lot of these lakes had Black Crappie introduced into them and as well as invasive flora and fauna found their way too (Milfoils and Gobies). The structure of the lakes changed dramatically. These lakes where better suited for the fast reproducing panfish that could easily escape predation by hanging out in the weeds. Now mind you, these lakes received huge amounts of fishing pressure as well. Now these lakes (mostly) do not even have walleye counted as a species even though a few are still caught here and there. MNR never bothered to close it and who knows if they'll come back. Best thing is while there is still a population existing, would be to close down the fishery completely. Look a Nipissing, the walleye population has rebounded amazingly there, although its a completely different lake all together. Practicing C+R on these Walleye may fatally injure them or stress them to the point of not reproducing imo. And push for a Walleye stocking program. On another note, where do these crappies hang out in the winter? I'll come up and take a few Seriously.